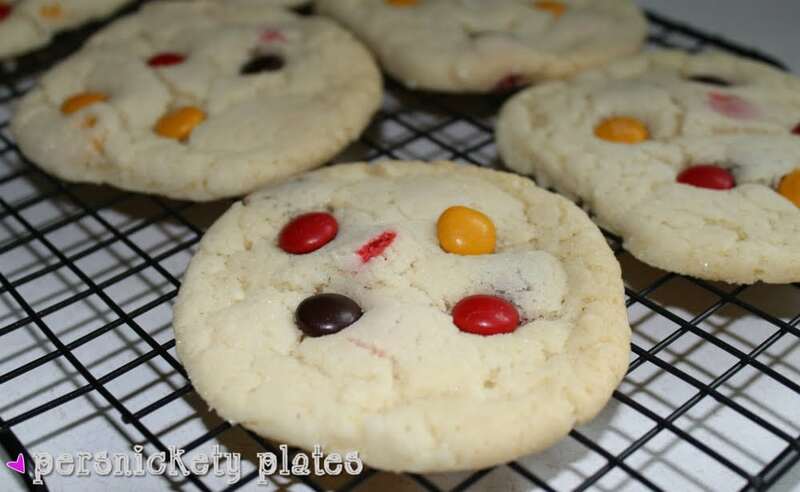 Chewy M&M Sugar Cookies – just like the Sugar Butter Cookies from the mall! Did you have a good weekend? I did. We did a lot of relaxing and some shopping. I spent a lot of money at ULTA. That was fun. We also did some visiting. I dropped some of these cookies off to friends and family. It’s in my best interest to share. If I keep them, I eat them. My favorite cookie from the mall is the Sugar Butter M&M. I haven’t had one in forever so when I saw these on Pinterest, I wanted to give them a try. I love the bright colors of the M&Ms but I found a bag of “Harvest Blend” (fall colored) M&Ms so I gave those a shot. They were appropriate for the cool days we had this weekend. I’m so excited about my new camera. I think the pictures are beautiful already and I don’t even really know how to use it yet. I’m going to look into taking a class so I don’t waste its potential. Chewy M&M Sugar Cookies taste just like the Sugar Butter Cookies you get from the mall! Preheat oven to 350 and line two baking sheets with foil or silicone liners. Or parchment paper. Add 1 1/2 cups of sugar and cream cheese to a large bowl. Put the remaining 1/3 cup sugar in a pie plate and set aside. Pour the warm butter over the cream cheese mixture and whisk to combine – the mixture won’t be completely smooth yet, but that’s ok. Whisk in the oil then the egg, milk and vanilla extract. Mix until smooth. Use a cookie scoop to make balls of dough. Roll the dough into a ball with your hands then roll in the sugar set aside in the pie plate previously (try to work quickly so the dough doesn’t get too warm). You should fit 12 per baking sheet. Use the bottom of a glass to flatten the dough balls into discs that are about 2″ in diameter. You can press a few more M&Ms into the top of the cookies now but they’ll crack as they bake so it’s usually better to press them in as they come out of the oven. Bake the cookies for about 10-12 minutes, or until the edges are set. Remove from oven and press the M&Ms on top if you haven’t already put them on top. The tops of the cookies will be puffy and slightly cracked. Transfer the baking sheet to a wire rack and let the cookies cool on the sheet for 5 minutes then transfer them to the rack to cool completely. You will love your new Canon T3. I just upgraded but it was such a great little camera. Have fun with it! Those are my absolute fav in the mall too! I get one, I eat it, and wonder if it would be inappropriate to order three more. 🙂 These look yummy! Yum!! I love a good sugar cookie. I feel like sugar cookies never get the same attention as other kinds.